When you are standing or seated for extended periods of time, you are putting more strain than normal on your back. Best Practice: Your posture at your seated or standing position needs to be supported in such a way to take the strain off your back to prevent pain or injury. When standing, wear comfortable shoes that are made to support you standing for hours at a time. When sitting, adjust your chair height and use seat/back pads for support. Movement is the best, so try to sit and stand throughout your day. Looking at bright computer screens in a dark room all day can have a major effect on your eyesight. You can develop headaches and migraines over time. Best Practice: Speak with your eye care professional about corrective lenses or having a special coating added to your glasses that can help your eyes adjust between different lighting. Also try adjusting the brightness setting on your computer/phone. 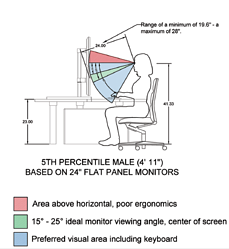 Monitor placement and size can result in unhealthy posture. Are you looking up to view your monitors? If you are, this is poor posture. This can put major pressure on your neck and shoulders resulting in a stiff neck. Best Practice: Proper ergonomic positioning guidelines suggest adjusting your monitors and/or your seated position to where you can view the monitors and use your work space without having to look up. 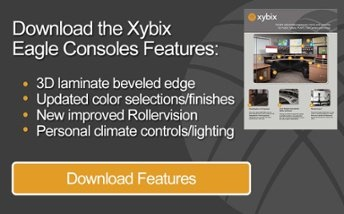 The preferred viewing angle is 15-20⁰ below horizontal eye height. By definition, “Trigger finger is a condition that causes pain, stiffness, and a sensation of locking or catching when you bend and straighten your finger. The condition is also known as stenosing tenosynovitis.” Having to type, write documents, and/or use a mouse repeatedly can cause you to develop trigger finger. Best Practice: Resting your hands when you have a break at work and not jumping to use the next technology device can help prevent further injury. Stretching can also help with better range of motion and mobility. Having poor posture can put more strain on your body and make routine tasks seem daunting. Being uncomfortable at work can make you uncomfortable at home and can also make getting a good night’s sleep difficult. Fatigue can have a detrimental effect on your overall health. Best Practice: Correct your posture in the work place and at home. Create an exercise routine to increase blood flow, give you more energy to be alert at work and to be able to rest properly at home. Remember to move throughout the day at your desk, a sit-to-stand desk that can fully adjust to proper ergonomic settings can help fight fatigue and increase motivation. Now that you are aware of poor ergonomics and how to improve your way of working, we urge you share this with your fellow co-workers and help them improve their health and well being.